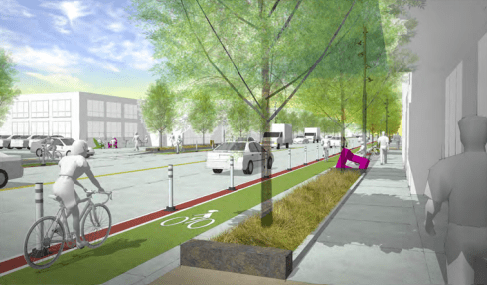 Some good-looking biking and walking improvements are coming to Brighton Boulevard in River North as part of a broader redevelopment plan, with the exact details subject to additional fine tuning. Advocates, residents, and business owners will meet tonight with city planners and hash out the design. The last public meeting with the Department of Public Works and the North Denver Cornerstone Collaborative, a group assigned by Mayor Michael Hancock to coordinate the rapid development in the area, was in February. Biking and walking infrastructure were the most important design elements to meeting participants, according to meeting minutes. Safer designs of cross streets and intersections were the biggest points of concern, so expect discussion of that tonight. The protected bike lane stretching from 29th and Brighton to 44th is the most attention-grabbing piece of the new design. The current proposal calls for raised bike lanes, which will be parking-protected along four blocks. BikeDenver Executive Molly North said the redesign process has resulted in significant gains for safe biking, but she hopes the latest design — a sloped “rollover” curb on the street side of the bike lane — will be replaced with a right-angled curb. Previous designs had bollards protecting the lane. A rollover curb is more of a suggestion for drivers than an order, North said, so she’s hoping that can be changed. The public meeting is at Summit Church, 3300 Larimer Street, from 5:30 – 7:30 p.m., with a presentation at 6 p.m.